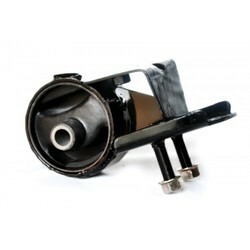 We offer top quality Engine Mounting to our valuable clients. These mountings are manufactured using good quality metal components, bolts, nuts, casting ferrous and non- ferrous procured from trusted vendors. Suitable for high vertical static and shock load in compression, these mounting provide high isolation value in the horizontal shear direction. We are offering superior quality Engine & Transmission Mountings 110, which is appreciated for its excellent performance, durable, reliability. These mountings are actively used in keeping the components of vehicle in a proper alignment. In addition to it, these also prevent the harsh noise and vibration that is made by vehicles. Combining the finest polices with strong business ethics, our firm is actively engaged in offering quality approved Engine Mounts. Our offered mounts are manufactured using the finest quality raw material and sophisticated technology in compliance with international standards. These mounts are widely used in several industries. This two point suspension element finds applicationwhere there are two locations of pivot required.- see the application photos. Housing up to size 45 made out of light alloy profile, size 50 made out of spheroidal graphite cast iron, the inner square section made out of light alloy profile with four "through bores". R & G Automotives Pvt. Ltd.
Keeping our synchronization with the expansions taking place in the industry, we are indulged in delivering an inclusive Rally Car Parts Engine Mounts. We are counted amongst reckoned names in the industry, committed towards manufacturing and supplying a high quality gamut of Automobile Engine Mounting. - To reduce the transmission of vibration in diesel engine. Manufacturer & Supplier of a wide range of products which include Automotive Sheet Metal press Components such as Shock Absorber Assembly And Peripheral Parts, Seating System Parts and Assemblies, Exhaust System Heat Shields, Brake Disks, Catalytic Convertor And Exhaust System Assembly Peripherals, Engine Mounting Parts and many more items. We are successfully meeting the varied needs of our patrons by offering a wide gamut of Engine Mounts as per their precise needs. We offer a wide assortment of Shear Compression Mount which is designed to withstand high compression load. These mounts have longer life under cyclic comprehensive loading. 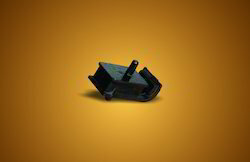 Our range of shear compression mount has two metal discs which are molded at either end of a rubber. Moreover, these discs are fitted with full threaded m.
In order to keep pace with never ending demands of the customers, our company is instrumental in presenting excellent quality assortment of Mild Steel Front Mounting. As one of the leading company of Damper Engine Mounting, we are satisfying our customers with our advanced technology. These products are durable in nature and accurate in dimensions. These products are developed keeping in mind the needs of market. We are offering these products in several specifications and sizes.